A refresh rate is the number of times your monitor updates with new images each second. For example, a 60 Hz refresh rate means the display updates 60 times per second. A higher refresh rate results in a smoother picture. Changing your refresh rate was more important on older CRT monitors, where a low refresh rate would actually result in the display visibly flickering as it updated. A higher refresh rate eliminated the visual flickering. On a modern flat-panel LCD monitor, you won’t see any flickering with a lower refresh rate. However, a higher refresh rate results in a much smoother picture. That’s why expensive monitors designed for gaming advertise high refresh rates like 144 Hz or 240 Hz, which is a big step up from the typical PC display’s 60 Hz refresh rate. To us, the difference is noticeable even when moving our mouse around on the screen. The maximum refresh rate you can use depends on your monitor. In general, cheaper monitors support lower refresh rates than more expensive monitors. 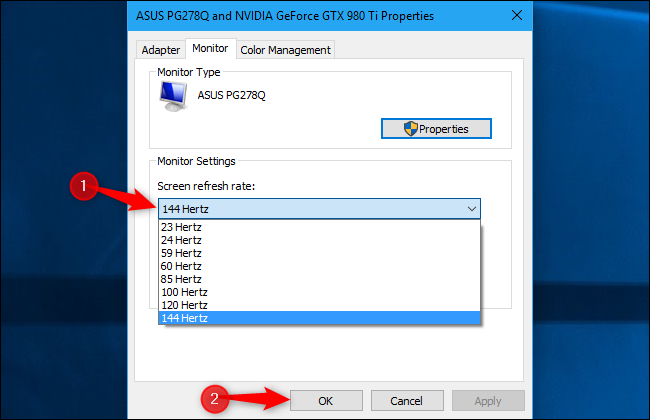 If you have multiple monitors connected to your PC, each has its own separate refresh rate setting. When shopping around for a monitor, a higher refresh rate is usually better, but it isn’t always the most important thing to look for. There are other important considerations like response time, color accuracy, and the monitor’s viewing angle. But you always want to use the highest refresh rate your monitor supports. 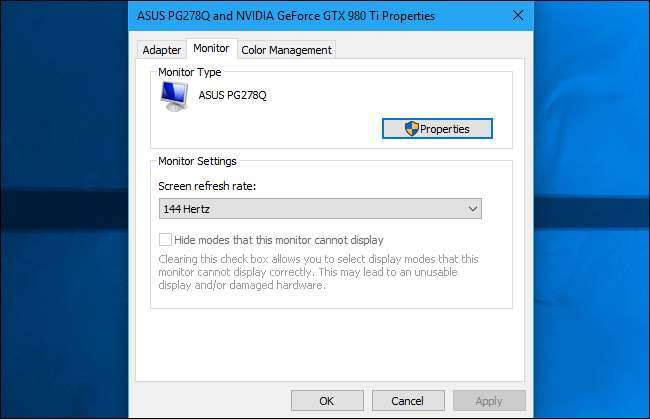 In general, modern PCs should automatically select the best, highest refresh rate for each monitor you connect. But this doesn’t always happen automatically, so you may sometimes need to change the refresh rate manually. 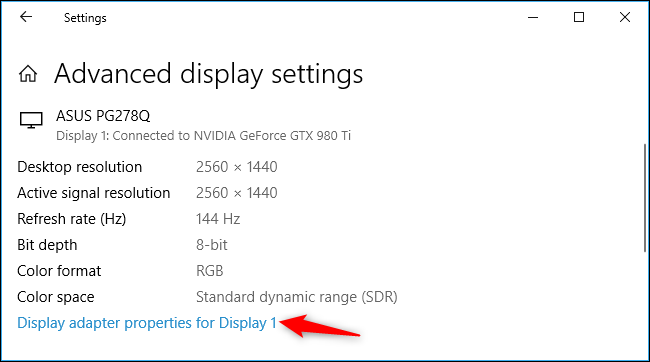 To change a display’s refresh rate on Windows 10, right-click the desktop, and then select the “Display Settings” command. Scroll down a bit on the right pane, and then click the “Advanced Display Settings” link to continue. Click the “Display Adapter Properties” link under the display you want to configure here. Click the “Monitor” tab in the properties window that appears, and then select your desired refresh rate from the “Screen Refresh Rate” box. Click “OK” to continue. Your change will immediately take effect. 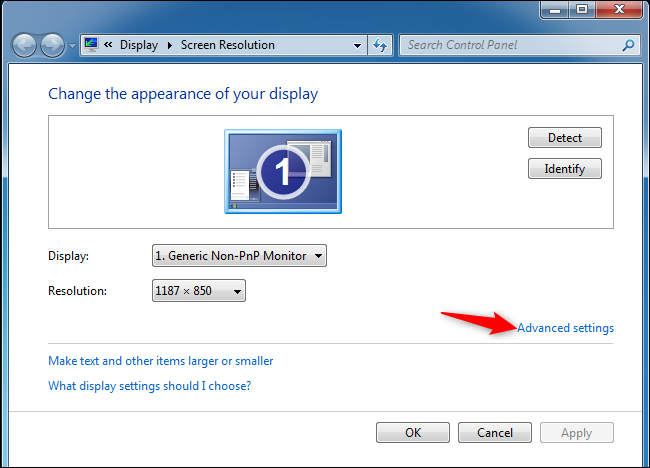 To change a monitor’s refresh rate on Windows 7, right-click your desktop, and then select the “Screen Resolution” command. If you have multiple displays connected to your PC, select the one you want to configure here. Click the “Advanced Settings” link to change its settings. Click the “Monitor” tab, and then choose your desired refresh rate from the “Screen Refresh Rate” box. Click “OK” to save your changes. Windows will immediately switch to the new refresh rate. What Does “Hide Modes That This Monitor Cannot Display” Do? 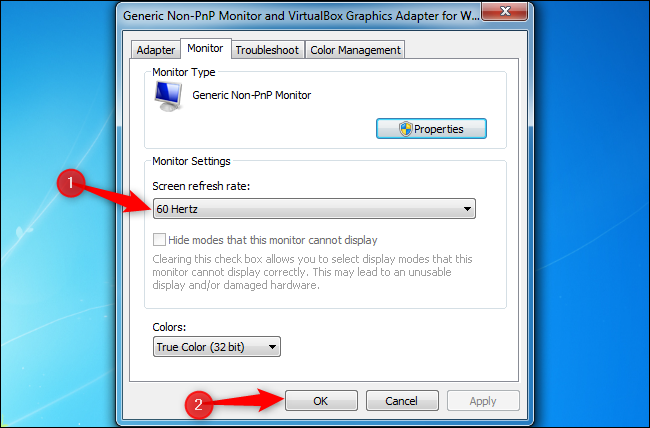 You will also see a “Hide modes that this monitor cannot display” checkbox below the “Screen Refresh Rate” option. In many cases, this option will be grayed out, and the options presented here are the only ones you can pick. In some cases, this option is available and you can uncheck the “Hide modes that this monitor cannot display” box to see more screen refresh rate options. In other words, this will show options your monitor claims it can’t support. These options will likely not work with your monitor, and you may see a blank screen or an error message if you select them. Windows warns this can even damage your monitor. We don’t recommend fiddling with this setting unless you know what you’re doing. Windows should automatically show all the refresh rates your monitor supports. 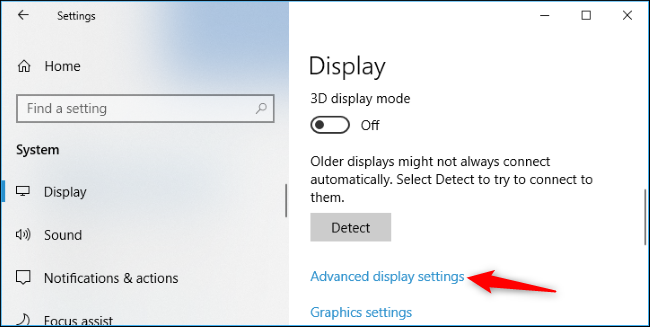 If you don’t see a refresh rate that your monitor advertisers support for as an option in Windows, you may need to do some troubleshooting. For example, you may have to update your graphics drivers to enable higher refresh rates. Or, if you’re using a slow display cable that doesn’t have enough data for a high-resolution display at a high refresh rate, you may need a better cable. Here are some more tips for getting the refresh rate your display advertises.